I loved this photo by Eric Freidebach! 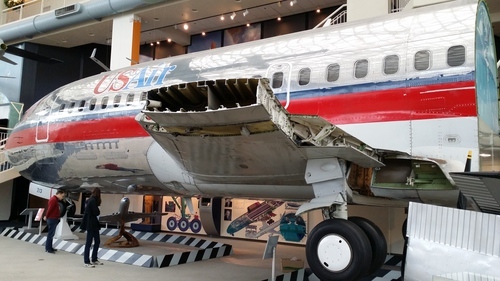 US Airways 737-200 N213US fuselage section on display at the Museum of Flight. The 737 is my second-favourite airframe, after the Lockheed L-1011 TriStar. I likely won’t ever get to fly in a 707, but the 737 shares its distinctive cockpit windows and fuselage cross-section. Note also the simple, rounded rectangle cabin windows; I reckon these are much nicer than the slightly-bulbous ones of most contemporary jets. What struck me about this photo though was how slender those wings were! And to think all its fuel had to fit in that space. Wild. The photo is preserved on Wikipedia Commons, because Google bought Panoramio and subsequently shut it down. Of course.